Our Buckeroos win 2018 NDCA League!!! 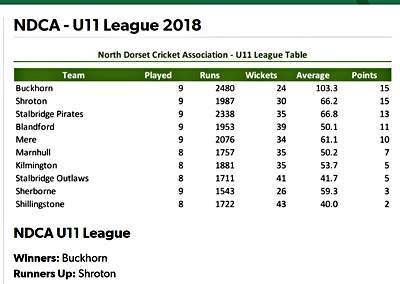 Our Under 11’s have played an amazing season of cricket and won the 2018 League! Our under 11 team have just been confirmed as League champions. Playing teams from across North Dorset over a 10 week league season it all came to a climax last Thursday night. Three teams all on 13 points – Buckhorn, Shroton and the mighty Stalbridge, with Buckhorn facing Stalbridge in the last round. Beating Stalbridge, traditionally the strongest club in the area, is a very tall order, even without the added pressure of the League title resting on it. But our boys not only won but set the highest total of the season, 362, without losing a wicket. Under 11 League Champions for the first time! A fantastic effort, even more impressive as we’re one of the smallest clubs in the league. A huge well done to all the Buckeroos who played across the season and of course the wonderful parents who support the children and club in so many ways.